Ancient Fairy Dragon and Black Rose Dragon are two of the 5 main Dragon-Type monsters in the 5 D’s animation. Both of these cards are adapted to specific Decks although they can function in any Deck. 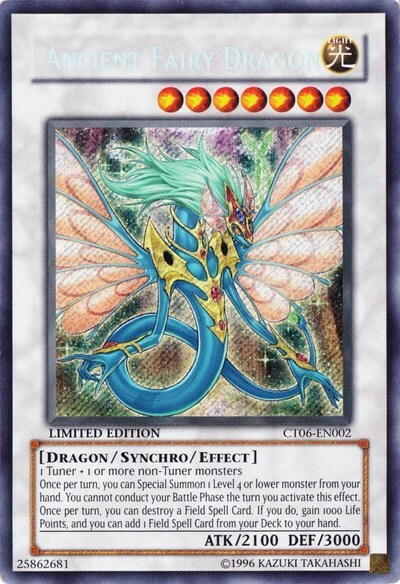 Ancient Fairy Dragon is a Level 7 monster with 2100 ATK and 3000 DEF that allows you to Special Summon 1 Level 4 or lower monster from your hand every turn. However, you cannot conduct your Battle Phase on the turn you use this effect. Ancient Fairy Dragon allows you to destroy 1 Field Spell Card on the field, gain 1000 life points for doing so, and then you get to add 1 Field Spell Card from your Deck to your hand. This card was a powerful threat to the Earthbound Immortal monsters since those monsters can only remain on the field if a Field Spell Card is present. 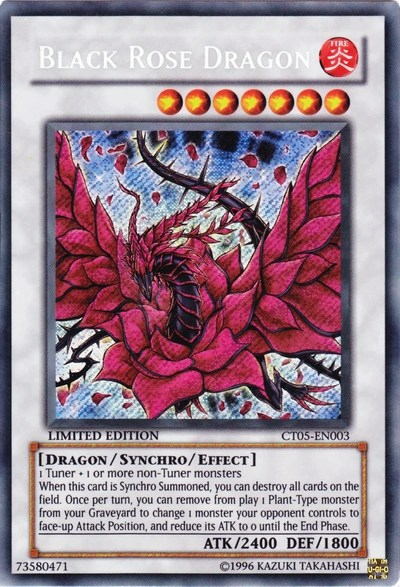 Black Rose Dragon is a Level 7 monster with 2400 ATK and 1800 DEF that allows you to destroy all cards on the field when it is Synchro Summoned successfully. By banishing 1 Plant-Type monster from your Graveyard, you can switch 1 monster your opponent controls to face-up Attack Position, and that monster’s ATK is reduced to 0 until the End Phase. This gives Black Rose Dragon enough time to destroy the monster and inflict 2400 damage to your opponent. The place where duelists win! See More Of My Yugioh Websites!